If you have ever visited Evergreen Brick Works for a market or special event, you’ve probably sipped on something from the Sipping Container. Built inside a reused shipping container, the micro-store sells coffee, tea, juice, wine, beer, spirits and cider such as Brickworks Ciderhouse, all locally sourced and sustainably made. In the few years we’ve operated the Sipping Container, it has impacted countless visitors by introducing them to local products they had not tasted before. Through partnerships with local businesses and brewers, the Sipping Container provides Evergreen Brick Works’ visitors with small batch ciders and other drinks while forging deeper community connections. This winter, we’ve partnered with Brickworks Ciderhouse to help support local connections like these at community hubs, both at Evergreen Brick Works and beyond. The diversity of events held at Evergreen Brick Works helps engage a wide range of visitors, from Summer Wednesdays to Dia de Muertos to the Future Cities Canada Summit. These events provide unique opportunities to connect local, craft cider makers with new communities through Evergreen Brick Works’ hub. As a point of personal connection, the Sipping Container often invites its network of local breweries to attend events to distribute samples to visitors. 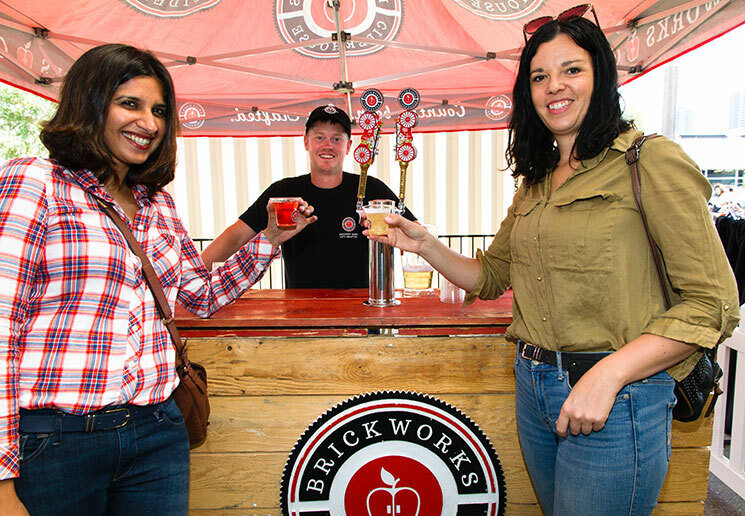 At Summer Wednesdays, Brickworks Cider brought their team to share their range of small batch ciders made just up the street at Brickworks Ciderhouse. By interacting with people on an individual level over a shared interest – in this case, enjoying summer in the Valley with a cool glass of cider – what was once an empty pavilion at Evergreen Brick Works became a lively destination for conversation, connection and community. The Sipping Container actively champions local, craft breweries and cideries. Not only is craft fresher, it allows more experimentation and fosters a community of enthusiasts who support their local brewers and ciderhouses. Through hubs like Evergreen Brick Works, people can connect with others in meaningful ways. Every single connection, whether it’s over a glass of cider or not, helps to make our cities flourish. Flourishing cities start with people. People working together to create spaces for all to feel engaged, included and welcome. To do that, there needs to be a sense of connection amongst community, which can stem from local hubs like Evergreen Brick Works or from simply sharing a glass of cider with a friend. This winter, Brickworks Ciderhouse’s holiday cider pack will be sold in LCBOs across Ontario. With every sale of every holiday pack, $5 will be donated to Evergreen to help strengthen local connections between urban and rural communities. With the help of local hubs, delicious cider and community connections, together we can shape our cities for the better.